CREVE COEUR IS IDEAL FOR SHORT BREAKS OR LONG WEEKENDS! From its position on a rise above Morzine's 18th century church, the Crève Coeur boasts magnificent views over Morzine and up to the heights of Avoriaz hanging 1000 metres above the valley. From the apartment it’s just a few minutes walk to restaurants, bars & shops (200m down to the lively Bourg area of town, 250m to the Carrefour supermarket and marketplace). The “A” free ski bus stops 80m from the door (winter), giving quick access to Avoriaz and the rest of the Portes du Soleil. The bus runs every 10 mins and takes 10 mins uphill to the new Avoriaz 3S high-speed cable car station, or 5 mins down to the Pleney lift in Morzine. If you come by car, there's an allocated parking place next to the building. The apartment has 2 bedrooms; a double (with king duvet) and a triple (single bed + bunk beds). In the lounge are 2 sofas (one converts into a sofabed), a couple of armchairs, and a dining table with benches. A balcony gives gorgeous views over the town. The bathroom has bath and overhead shower, and a separate WC. The kitchen has gas hob, full-size electric oven, fridge, microwave, kettle, and dishwasher. The apartment is comfortable with a family of 5, or we would recommend it for a group of 4 adults. 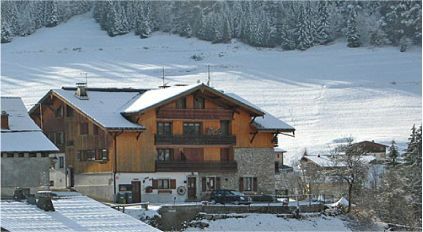 It's a simple apartment but has everything you need for a ski week or long weekend. Rental rates for long weekends are as per the weekly rates on the chart below, except for the below short breaks. LONG WEEKEND STAYS CAN RUN FOR ANY DURATION BETWEEN A THURSDAY AND THE FOLLOWING THURSDAY.